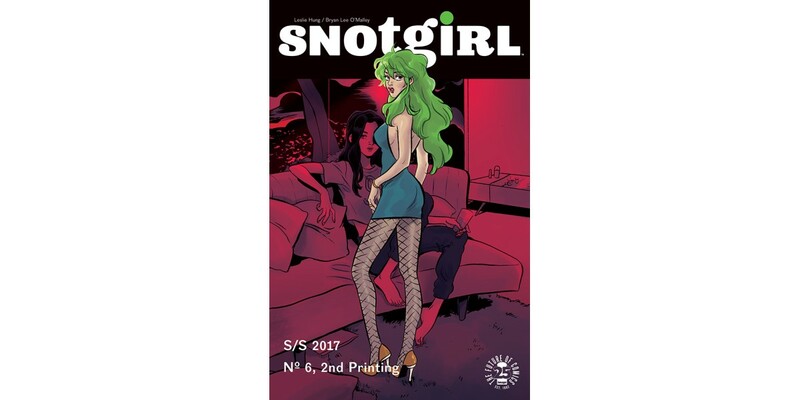 The sixth issue of the bestselling SNOTGIRL by Bryan Lee O’Malley and Leslie Hung is being rushed back to print in order to keep up with overwhelming customer demand. SNOTGIRL #6 begins a new story arc, and this month spring is the season for mystery, madness & mucus as Lottie meets her adoring public, Coolgirl has a change of heart, and readers learn more than they ever wanted to know about Cutegirl! From the creator of Scott Pilgrim, SNOTGIRL follows Lottie Person, a glamorous fashion blogger living her best life—at least that’s what she wants you to think. The truth is, she’s an allergy-ridden mess who may or may not have killed somebody. SNOTGIRL #6 will remain available for purchase across all digital platforms, including the Image Comics website (imagecomics.com), the official Image Comics iOS app, Comixology’s website (comixology.com), iOS, Android, and Google Play. SNOTGIRL #6, 2nd printing (Diamond Code JUN178448) will be available on Wednesday, August 23rd. The final order cutoff deadline for comics retailers is Monday, July 31st.